Earth is inside a solar wind stream flowing from the indicated coronal hole. Credit: SDO/AIA. ENDEAVOUR HAS LEFT THE PLANET: The space shuttle lifted off this morning at 8:56 am EDT on a two week mission to the International Space Station. There it will deliver the Alpha Magnetic Spectrometer--a $1.5 billion cosmic ray detector that could reveal the nature of dark matter and find whole galaxies made of antimatter. This is Endeavour's final flight as the shuttle program winds down. During the mission, Endeavour will make numerous passes over North America, Australia, and other places. Would you like to see it one last time? Turn your cell phone into a field-tested shuttle tracker. "The sky was very dramatic when this halo appeared on May 14th," says Rosén. He was so inspired that he took ten pictures and stitched them together into a beautiful panorama. 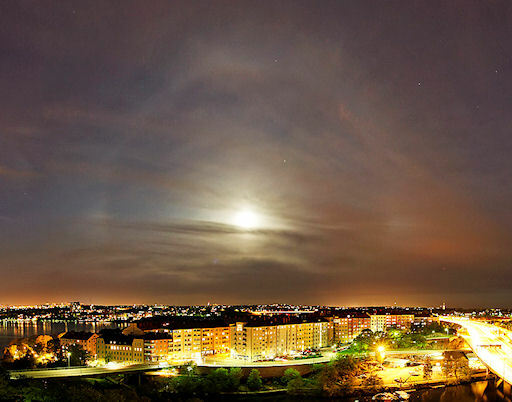 Moon haloes appear when moonlight shines through cirrus clouds filled with ice crystals even more abundant than spring flowers. The brighter the Moon, the brighter the halo, so any haloes around tonight's full Moon could be impressive indeed. Be alert! 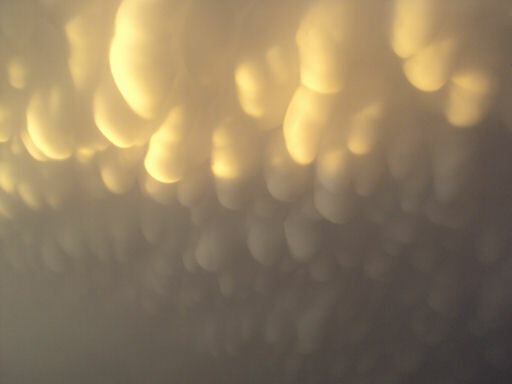 These are mammatus clouds. Named for their resemblance to a cow's underbelly, they sometimes appear at the end of severe thunderstorms when the thundercloud is breaking up. Researchers have called them an "intriguing enigma," because no one knows exactly how and why they form. The clouds are fairly common but often go unnoticed because potential observers have been chased indoors by the rain. If you are one of them, dash outside when the downpour stops; you could witness a beautiful mystery in the sky. NEW SATELLITE TRACKING TOOL: Have you ever wondered, what's orbiting over your head right now? A new satellite-tracking tool called WhatSat can answer that question for you. It's an app for Android phones that tells you what's overhead, helps you find satellites in the night sky, and "tags" satellites you've seen. Many satellite-tracking tools are available, but none is quite like this; view the demo video to learn what makes WhatSat unique. On May 16, 2011 there were 1224 potentially hazardous asteroids.